There is no harder task for adults than changing our behavior. For many of us, change is impossible because we are so optimistic (and delusional) that we try to change everything at once. We quickly overwhelm ourselves with becoming the “new Me”, and when it doesn’t happen as quickly as we’d like, people don’t notice that we’ve made a change, or some obstacle presents itself, we give up. Discouraged by our failure, overwhelmed and disheartened, it’s hard to commit to change again. So, we become geniuses at coming up with reasons to avoid change. We make excuses. We rationalize. We harbor beliefs that trigger all manner of denial and resistance—and we end up changing nothing. Ever. We fail to become the person we want to be. So, seeing our frailties in the face of behavioral change what do we do? For many years now, I’ve been using “The Wheel of Change” to help clients decide what to change and where to put their efforts. I’ve taken teams, organizations, friends, and peers through this process, and I’ve even use it myself. 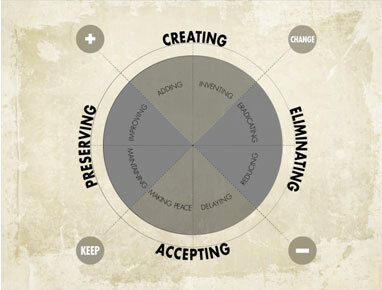 It is one of the most helpful tools for behavioral change that I’ve ever found. The Wheel of Change illustrates the interchange of two dimensions that we need to sort out before we can become the person we want to be. The positive to negative axis tracks the elements that either help us or hold us back. The change to keep axis tracks the elements that we determine to change or keep in the future. Thus, in pursuing any behavioral change we have four options: change or keep the positive elements, change or keep the negative. Here’s a brief description of each of these options. Creating represents the positive elements that we want to create in our future. Creating is the glamorous poster child of behavioral change. When we imagine ourselves behaving better, we think of it as an exciting process of self-invention. We’re creating a “new me.” It’s appealing and seductive. We can be anyone we choose to be. The challenge is to do it by choice, not as a bystander. Are we creating ourselves, or wasting the opportunity and being created by external forces instead. Preserving represents the positive elements that we want to keep in the future. Preserving sounds passive and mundane, but it’s a real choice. It requires soul-searching to figure out what serves us well, and discipline to refrain from abandoning it for something new and shiny and not necessarily better. We don’t practice preserving enough. Eliminating represents the negative elements that we want to eliminate in the future. Eliminating is our most liberating, therapeutic action—but we make it reluctantly. Like cleaning out an attic or garage, we never know if we’ll regret jettisoning a part of us. Maybe we’ll need it in the future. Maybe it’s the secret of our success. Maybe we like it too much. Accepting represents the negative elements that we need to accept in the future. Most of us tend to commit to the other three four elements in the wheel of change with greater enthusiasm—creating is innovating and exciting, preserving makes sense as we focus on not losing sight of the good things about ourselves, eliminating appeals to the “do-or-die” element of our natures as we commit to stop doing things that no longer serve us, but accepting is a more difficult pill to swallow. Acceptance is an odd player in the process of change—it feels like admitting defeat, it’s equated by many to acquiescence. Acceptance is incredibly valuable when we are powerless to make a difference. Yet our ineffectuality is precisely the condition that we are most loath to accept. This truth triggers our finest moments of counterproductive behavior. These are the choices. Some are more dynamic, glamorous, and fun than others, but they’re equal in importance. And three of them are more labor-intensive than we imagine. And, that’s the simple beauty of the wheel. When we bluntly challenge ourselves to figure out what we can change and what we can’t, what to lose and what to keep, we often surprise ourselves with the bold simplicity of our answers and can thus take significant, real steps towards becoming the person we really want to be. The Most Important Thing You Can Do If You Really Want to Change » « Do You Work with a Credit Hog?